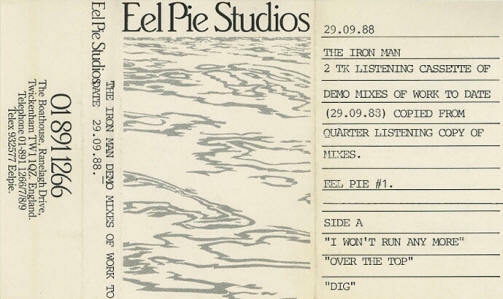 The above is a "demo mixes cassette" of "Iron Man". I got this tape subsequent to the tape below. This tape is almost how I always imagined "Iron Man" - A Pete Townshend album without the guest singers ("All Shall Be Well" being the exception as Pete shares lead vocals with another singer). Absolutely amazing. Some notable differences are the inclusion of "Real World", which appeared as <mostly> instrumental track on the "A Friend Is A Friend" (EP) and a variation of the same on "Scoop 3". This version has vocals and sung by Pete! There's an interview with Pete about how he loved how Nina Simone captured his vocal performance on "Fast Food" - but this is quintessential Pete. I was never a fan of Nina's vocals, but I absolutely love this. 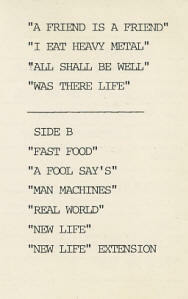 Pete Townshend lyrics for "Real World"